.Net framework 2.0 or above version, which is included in the installation package. First of all, get the package. Double click the package, on the license agreement screen, click [Agree]. Then comes the screen of selecting location, accept the default path, or click [Browse] to change the path. On the next screen, choose the installation type. There are three types of installation, Complete, Client and Custom. Complete ---- If this computer is used as the server, choose this option. Client ---- Only Client Component will be installed on this computer, which means there must be another computer with server component installed on it. If you are new to ExcelServer, we recommend that you choose 'Complete' option. The next screen shows if all the prerequisites are satisfied, click [Next]. The next screen shows all the options you have selected, click [Next] to start installation, or click [Previous] to change options. Begin Copying files and wait. If SQL Server is not exist on the computer, the installing program will automatically install the Microsoft SQL Server Desktop Engine(MSDE) for you. You will see the following dialog, ask for setting a password of 'sa', which is the super login of SQL Server, enter a password (anything as you will) and remember it, because it will be used on the next step. Clck [Ok] and wait for the installation of MSDE completed. 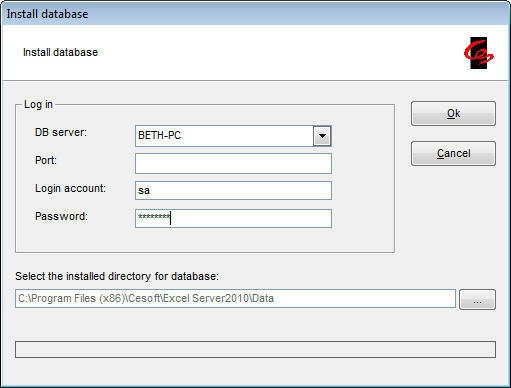 DB Server: The SQL Server instance name where you want to reside the database of ExcelServer, in most circumstance, it is the computer name where the SQL Server is installed, accept the default value. Port: do not need to enter if the 'DB Server' is the current computer. Login account: a login account of SQL Server,for example 'sa', which is super login of SQL Server. Password: the password of 'Login account'. If the MSDE has just been installed on the previous step, both the 'Login account' and 'Password' are locked, with the value of what you entered on the previous step. Accept the default location of database, or click [...] the change. Click [OK] to create database for ExcelServer. Then have nothing to do but let it go, on the last screen, click [Finish].